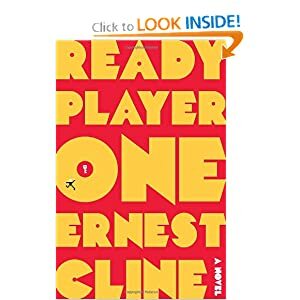 Ready Player One by Ernest Cline is the the best book about video games you will read this year. However, this is not a history book, nor is it a personal narrative. Instead, Ready Player One history lesson in 80’s pop culture wrapped inside an engaging sci-fi story. The story is set in the mid 21st century, after all the disasters that threaten to befall the world right now, come to pass: peak oil, global warming, famine, drought, long-term massive unemployment, etc. The one bright spot (if you can call it that) is the OASIS, an online world in the vein of World Of Warcraft that has usurped the internet, and has became the defacto “reality” for most of the world’s population. Just before he died, James Halliday, the creator of OASIS devised a game , inspired by Atari’s Adventure, by hiding an Easter Egg somewhere in the OASIS that would grant the winner full control of OASIS and access to his vast fortune. He gave one clue , and as the book opens, the world has been trying to figure out that single clue for five straight years, with no avail. The hero of the story, Wade, is an everyman who has been affected by the worldwide downturn as much as anyone else. He is a “gunter”, the name given to people who spend all their time trying to figure out how to find Halliday’s Easter Egg. His story and the pathway to the Easter Egg form the narrative of the book. I will give no more away, except to say that this is also the perfect book for 8bitrocket.com. Cline goes to great lengths to include bits of nostalgia that will suit every taste…but much of it centers on the era of Golden Age, 8-bit, Atari. Since James Halliday was an 80’s fanatic, all of the gunters have enveloped themselves in the most minute 80’s trivia imaginable, trying to find clues to find the egg. This gives the author an excuse to weave the games, tv shows, movies, music, etc. from the 80’s in a futuristic setting .It also keeps the story moving without it becoming a pure nostalgia piece. It was a brilliant move, as it allows the author space to set the book the future and the past at the same time without attempting some kind of time travelling mechanic. In fact, in a way, this book sort of warns of a situation in our not-too-distant future, where there is no “past” at all, and everything just exists in the present. Ready Player One is a fun, accessible page turner that will appeal to anyone who enjoys video games, the 80’s, dystopic sci-fi, mysteries, or any combination of those topics. With this book and Lucky Wander Boy, we now have a “collection” of great novels based on video game nostalgia to put onto our required reading shelf.